Chris Messina. Photo by Kat Borlongan. When Carnegie Mellon University alumnus Chris Messina (A'03) first suggested using a hashtag (#) sign on Twitter on Aug. 23, 2007, he was just trying to help people group together topics. What he did was create a cultural phenomenon, one that extends beyond social media to include tattoos, album covers and Super Bowl ads. "I'm always happily surprised when I discover an unexpected use of the hashtag," Messina said. Messina came up with the concept of the hashtag for Twitter after thinking about how the symbol was used in Internet chat (IRC) to indicate the name of a chat room. "It seemed to me that appropriating something that was already used elsewhere would increase its chances of adoption, rather than promoting something completely new," he said. That adoption has become widespread as people use hashtags to tell jokes, to advertise or to follow topics such as social movements and international news. "They let you express pretty complex ideas efficiently," Messina said. "They work; they're easy — and increasingly you can use them just about everywhere online to connect with others who want to talk or share about the same things." 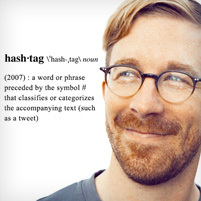 The game of Scrabble just added "hashtag" to its Fifth Edition of the Official Scrabble Dictionary. The Oxford English and Merriam-Webster dictionaries added it this spring. When Messina was at CMU as a communications design student in the School of Design, he participated in a range of cross-disciplinary conversations inside and outside the classroom. He said he learned through observation, questioning and challenging assumptions. "In the design program, I learned how to think about problems and observe people's actual behavior, rather than what they reported, which was often wrong or misleading," Messina said. "Cognitive science informed my understanding of why people often deceive themselves without realizing it. Engineering gave me a sense for how to approach team projects and find opportunities that maximized each individual's contributions. "I honed my ability to recognize patterns in people's behaviors to create products, ideas or practices that addressed their essential desire, and then relied on my rhetorical training from Design Thinking to whittle down my solution into a narrative that could resonate with different audiences." Dan Boyarski, professor and director of Alumni Relations for the School of Design, recalled Messina when he was a student. "Chris was a tinkerer at heart, especially with one foot in design and the other in the tech sphere," Boyarski said. "So it's no surprise that he came up with the hashtag as a way to group and classify Tweets. Making unexpected connections is what a good designer does." Messina, who has worked for startups and for Google, has spent the past year as a design/product consultant and thinking about the future. "In terms of what's next — that's proven to be challenging to pin down. I know I'd like to work on a problem I find interesting and deep, and one that requires social software in the solution," he said. "I'd like to exercise my design abilities, but also my storytelling and community-building skills."